"Duchess of Sussex" redirects here. For the title, see Duke of Sussex. Meghan, Duchess of Sussex (born Rachel Meghan Markle; August 4, 1981), is a retired American actress who became a member of the British royal family upon her marriage to Prince Harry. Markle was born and raised in Los Angeles, California, and has a mixed ethnic heritage. During her studies at Northwestern University, she began playing small roles in American television series and films. From 2011 to 2017, she played Rachel Zane on the American legal drama series Suits. An outspoken feminist, Markle has addressed issues of gender inequality, and her lifestyle website The Tig featured a column profiling influential women. She represented international charity organizations in the 2010s and received recognition for her fashion and style, releasing a line of clothing in 2016. From 2011 until their divorce in 2013, Markle was married to actor and producer Trevor Engelson. In 2017, she announced her engagement to Prince Harry, grandson of Queen Elizabeth II, and moved to London. She retired from acting, closed her social media accounts, and started undertaking public engagements as part of the British royal family. She became the Duchess of Sussex upon her marriage to Prince Harry in May 2018. Rachel Meghan Markle was born on August 4, 1981, in Los Angeles, California. Her mother, Doria Ragland, is a former social worker and yoga instructor living in View Park–Windsor Hills, California. Markle has often described having a very close friendship with her mother. Her father, Thomas Markle Sr., who lives in Rosarito, Mexico, is a retired television director of photography and lighting director, whose profession resulted in his young daughter often visiting the set of Married...with Children. Markle's parents divorced when she was six years old. She has two older paternal half-siblings, Samantha Markle and Thomas Markle Jr., from whom she is reportedly estranged. Describing her heritage in a 2015 essay for Elle, Markle stated: "My dad is Caucasian and my mom is African American. I'm half black and half white ... While my mixed heritage may have created a grey area surrounding my self-identification, keeping me with a foot on both sides of the fence, I have come to embrace that. To say who I am, to share where I'm from, to voice my pride in being a strong, confident mixed-race woman." Markle grew up in Hollywood. She was educated at private schools, beginning at age two at the Hollywood Little Red Schoolhouse. At age 11, her successful campaign to get Procter & Gamble to change a national television commercial she viewed as sexist was profiled by Linda Ellerbee on Nick News. Though she was raised as a Protestant, Markle attended Immaculate Heart High School, an all-girl Catholic private school in Los Angeles. She then attended Northwestern University, where she joined Kappa Kappa Gamma sorority and participated in community service and charity projects. She also served an internship at the American embassy in Buenos Aires, Argentina, and studied for a semester in Madrid, Spain. Markle received a bachelor's degree from Northwestern's School of Communication in 2003, with a double major in theater and international studies. Early in her career, Markle worked as a freelance calligrapher to support herself between acting jobs. Her first on-screen appearance was a small role as a nurse in an episode of the daytime soap opera General Hospital. Markle had small guest roles on the television shows Century City (2004), The War at Home (2006), and CSI: NY (2006). She also took on several contract acting and modeling jobs, including a stint as a "briefcase girl" on the US game show Deal or No Deal. She appeared in Fox's series Fringe as Junior Agent Amy Jessup in the first two episodes of its second season. Markle had some difficulty getting roles early in her career. In 2015, she wrote: "Being 'ethnically ambiguous', as I was pegged in the industry, meant I could audition for virtually any role ... Sadly, it didn't matter: I wasn't black enough for the black roles and I wasn't white enough for the white ones, leaving me somewhere in the middle as the ethnic chameleon who couldn't book a job." Markle appeared in two 2010 films, Get Him to the Greek and Remember Me, and one 2011 film, Horrible Bosses. She was paid $187,000 for her role in Remember Me and $171,429 for her role in the short film The Candidate. She also appeared in episodes of Cuts; Love, Inc.; 90210; Knight Rider; Without a Trace; The League; and Castle. In July 2011, Markle joined the cast of the USA Network show Suits. Her character, Rachel Zane, began as a paralegal and eventually became an attorney. She completed work on the seventh season in late 2017. According to a critique in The Irish Times, Markle "actively re-positioned" her character from ingénue to "the show's moral conscience" and gave viewers the unique portrayal of a daughter, whose African-American father is in a position to help her career and advance her "desire to crack both racial and gender glass ceilings". While working on Suits, Markle lived for nine months each year in a rented house in the Seaton Village neighborhood of Toronto. Fortune magazine estimated that Markle was paid $50,000 per episode, amounting to an annual salary of about $450,000. In 2014, Markle founded the lifestyle website The Tig, where she wrote about food, fashion, beauty, and travel, and profiled inspirational women. As the website grew, Markle brought in experts such as dieticians, make-up artists, and fitness and yoga instructors. The website's audience consisted primarily of the fans of Markle and Suits. Markle reinforced The Tig's messages of self-love, positivity, and spirituality on social media, reaching 3 million followers on Instagram, 800,000 on Facebook, and 350,000 on Twitter. She closed The Tig in April 2017, taking all of its articles offline, and deleted her social media accounts in January 2018. It was estimated that, as a lifestyle blogger, Markle earned about $80,000 annually from endorsements and sponsorships. Markle began a relationship with actor and producer Trevor Engelson in 2004. They were married in Ocho Rios, Jamaica, on September 10, 2011, and concluded a no-fault divorce in August 2013, citing irreconcilable differences. Markle's subsequent relationship with celebrity chef and restaurateur Cory Vitiello lasted almost two years, ending in May 2016. In June 2016, Markle began a relationship with Prince Harry, whom she had met on a blind date set up by a mutual friend. He was then fifth in line to the British throne; his grandmother Elizabeth II is queen of the United Kingdom and 15 other Commonwealth realms, as well as Head of the Commonwealth. In November, the British royal family's communications secretary released an official statement that addressed sexism, racism, and defamatory stories directed toward Markle. In September 2017, Markle and Prince Harry appeared together in public for the first time at an official royal engagement at the Invictus Games in Toronto, Canada. Markle's engagement to Prince Harry was announced on November 27, 2017, by Clarence House and Kensington Palace. The announcement prompted generally positive comments about the possible social significance of a mixed-race member of the royal family. Markle announced that she would retire from acting, and began the process of becoming a British citizen. In preparation for the wedding, the Archbishop of Canterbury, Justin Welby, baptized Markle and confirmed her into the Church of England on March 6, 2018. The private ceremony, performed with water from the River Jordan, took place in the Chapel Royal at St James's Palace. The marriage ceremony was held on May 19 at St George's Chapel, Windsor Castle. The Duke and Duchess lived at Nottingham Cottage in London, on the grounds of Kensington Palace. They later moved to Frogmore Cottage in Home Park, on the grounds of Windsor Castle, and their office was moved to Buckingham Palace. They are expecting their first child in 2019. The child will be seventh in line to the throne. Markle was politically vocal before joining the British royal family. She backed Hillary Clinton during the 2016 United States presidential election and described Clinton's opponent, Donald Trump, as "misogynistic" and "divisive". The same year, when the referendum on the United Kingdom's membership of the European Union resulted in 51.9% of voters being in favor of Brexit, Markle expressed her disappointment on Instagram and posted a placard saying: "If EU leave me now, you take away the biggest part of me." This, as well as her recommendation of Noam Chomsky's book Who Rules the World?, led Emine Sar of The Guardian to conclude that Markle would become "the most leftwing member of the royal family". Members of the royal family are politically neutral by convention, and Dickie Arbiter, former press secretary to Prince Charles, expects the Duchess to follow suit. Historian Robert Lacey said she was the most "feisty and spiky" person to marry into the royal family since her grandfather-in-law Prince Philip. After the engagement, Markle's first official public appearance with Prince Harry was at a World AIDS Day walkabout in Nottingham on December 1, 2017. In February, she attended the first annual forum of The Royal Foundation; she became the foundation's fourth patron, alongside Prince Harry, his brother Prince William, and sister-in-law Catherine, after her marriage into the royal family. Markle and Harry marked International Women's Day by attending an event in Birmingham hosted by the Stemettes. Along with the Queen and other members of the royal family, she attended the Commonwealth Day service at Westminster Abbey on March 12. The couple made their first visit to Northern Ireland on March 23. Markle carried out a total of 26 public engagements prior to the wedding. The Duchess's first official engagement after the wedding came on May 22 when she and her husband celebrated the charity work of his father, Prince Charles. Her first trip abroad at the request of the British government was to Dublin, Ireland, in July 2018. The Duchess takes part in her husband's work as youth ambassador to the Commonwealth, which includes overseas tours. The first such trip was to Australia, Fiji, Tonga and New Zealand in October 2018. Despite the dwindling support for the monarchy in Australia, the couple were greeted by crowds in Sydney, and the announcement of the Duchess's pregnancy hours after their arrival was received enthusiastically by the public and media. During their visit to Morocco in February 2019, the Duke and Duchess focused on projects centered on "women's empowerment, girls' education, inclusivity and encouragement of social entrepreneurship". In 2018, Time magazine included Markle on its list of the 100 Most Influential People in the World, and placed her on its shortlist for Person of the Year. She was also chosen as one of the most influential women in the United Kingdom by Vogue magazine. In April 2019, the Duke and Duchess of Sussex created their Instagram handle @sussexroyal, which broke the Guinness World Record for fastest account to reach 1,000,000 followers. As editor-in-chief of The Tig, Markle became known for her fashion sense. She released two fashion collections with Canadian clothing company Reitmans in 2015 and 2016. The lines were based on her personal style and that of her Suits character, described as "aspirational girl next door", and quickly sold out. Markle has cited Emmanuelle Alt as her style inspiration. In an interview with Glamour, the Duchess said that she favored "that French way of styling, where if your outfit is pulled together, then something's got to be dishevelled—your hair, your make-up". In her youth, Markle's "sensibility had always been relaxed California girl style" consisting of jeans, cut-offs and flip-flops. She usually prefers "streamlined dresses" with "neutral colors" and boat-neck necklines, and likes "monochromatic and tonal dressing". She has worn outfits and ensembles by a wide variety of fashion designers. In December 2017, Markle caused a surge in interest in Scottish retailer Strathberry after carrying one of their handbags to a public event shortly after her engagement. This was reported as an indication that her fashion choices would produce her own version of the Kate effect. It has been speculated that Markle's effect would be greater, as she has a strong appeal in America. After Markle and Prince Harry's first appearance as a couple, brands Mackage, Birks, R&R Jewelers, Crown Jewelers and Everlane noted an upswing in their website hits and sales. In 2018, Tatler named the Duchess on its list of Britain's best dressed people, praising her for redefining "modern royal style with every subsequent appearance". Following the announcement of her pregnancy, the Duchess appeared in a Karen Gee dress which resulted in the breakdown of the designer's website. She was ranked one of the best dressed women in 2018 by fashion website Net-a-Porter, and was nominated for the 2018 Teen Choice Awards in the category Choice Style Icon. Markle and sportsmen Brian Urlacher and Doug Fister address the audience during a USO show at Naval Station Rota, Spain, December 6, 2014. Markle was a counselor for international charity One Young World. At the 2014 summit in Dublin, she spoke on the topics of gender equality and modern-day slavery. Also in 2014, she toured Afghanistan and Spain with the United Service Organizations. In 2016, Markle became a global ambassador for World Vision Canada, traveling to Rwanda for the Clean Water Campaign. In 2016, after a trip to India focused on raising awareness for women's issues, she penned an op-ed for Time magazine concerning stigmatization of women in regard to menstrual health. She has also worked with the United Nations Entity for Gender Equality and the Empowerment of Women as an Advocate. The Duchess is a vocal feminist and will use her role as a member of the royal family to continue supporting women's rights and social justice. Markle became interested in the Hubb Community Kitchen, run by the survivors of Grenfell Tower fire, in January 2018. She visited the kitchen regularly throughout 2018, and suggested that the displaced women publish a cookbook to obtain funding for it. Together: Our Community Cookbook, her first charity project as Duchess of Sussex, was announced in September. Her patronage of the Royal National Theatre, the Association of Commonwealth Universities, Smart Works, and Mayhew reflects her earlier interests in the arts, access to education, women's empowerment, and animal well-being, respectively. The Duchess was appointed the vice president of the Queen's Commonwealth Trust, which focuses on projects involving children and welfare of prisoners, in March 2019. Upon her marriage to Prince Harry, Meghan Markle became a princess of the United Kingdom entitled to the style of Royal Highness, as well as Duchess of Sussex, Countess of Dumbarton and Baroness Kilkeel. She is styled as "Her Royal Highness The Duchess of Sussex", and she is the first person to hold that title. Meghan bears the arms of her husband impaled with her own. Thomas Woodcock, Garter King of Arms, the senior officer of the College of Arms, helped the Duchess with the design, which was approved by the Queen. Quarterly 1st and 4th Gules three lions passant guardant in pale Or armed and langed Azure (England), 2nd Or a lion rampant Gules armed and langued Azure within a double tressure flory counterflory (Scotland), 3rd Azure a harp Or stringed Argent (Ireland), the whole differenced by a label of five points Argent, the first, third and fifth points charged with an escallop Gules (Prince Harry); Impaled with a shield Azure a feather bendwise Argent quilled Or between two bendlets Or all between two like feathers Argent quilled Or (Markle). 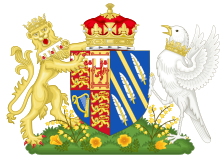 On the dexter side the lion used as a supporter by the Duke of Sussex and to the sinister a songbird Argent wings spread, unguled Or and gorged with the coronet of the Duke of Sussex. Below the shield, a mount of grass with golden poppies and wintersweet in flower. The blue background of the shield represents the Pacific Ocean off the California coast, while the two golden rays across the shield are symbolic of the sunshine of the Duchess's home state. The three quills represent communication and the power of words. Beneath the shield on the grass sits a collection of golden poppies, California's state flower, and wintersweet, which grows at Kensington Palace. The songbird with wings elevated as if flying and an open beak represents the power of communication. 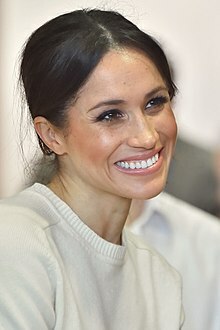 On her mother's side, the Duchess of Sussex is descended from African Americans enslaved in Georgia, and on her father's side from German, English, and Irish settlers. One of her possible forefathers, Heinrich Martin Merckel, emigrated to the United States from Lampertsloch, an historically German-speaking town in Alsace, and later changed the spelling of his name to Markle. Among her father's distant ancestors are Captain Christopher Hussey, King Robert I of Scotland, Sir Philip Wentworth, and Edward III of England. ^ Booth, Robert (November 27, 2017). "Red carpets, refugee camps and royalty: the life of Meghan Markle". The Guardian. Retrieved February 12, 2019. ^ Morris, Regan (September 27, 2017). "'Meghan who?' LA shrugs over Harry's hometown girlfriend". BBC News. Archived from the original on September 30, 2017. Retrieved November 28, 2017. But Markle's mother lives in the View Park-Windsor Hills neighbourhood, which is one of the wealthiest, primarily African American areas in the US. ^ CNN, Angela Dewan,. "Doria Ragland: Meghan Markle's mother by her side on wedding day". CNN. Retrieved May 31, 2018. ^ "Meghan Markle's father lives in a quiet Baja town; but the British pa..." May 5, 2018. Archived from the original on May 5, 2018. ^ a b c Goulet, Matt (July 13, 2013). "Meghan Markle Talks Suits, Catholic Childhood and Growing Up On Set of Married With Children". Esquire. Hearst Communications, Inc. Archived from the original on February 27, 2017. Retrieved January 14, 2014. ^ Hicks, Tony (November 1, 2016). "Prince Harry ready to meet Meghan Markle's father". Mercury News. Archived from the original on November 12, 2016. Retrieved November 12, 2016. ^ John, Tara (November 27, 2017). "Meet Meghan Markle, Prince Harry's Fiancee And Britain's Newest Royal-To-Be". Time. Archived from the original on November 28, 2017. Retrieved November 30, 2017. ^ "Meghan Markle's half-sister to write a tell-all book about her 'pushy' sibling". The Daily Telegraph. April 3, 2017. Archived from the original on June 11, 2017. Retrieved November 30, 2017. ^ Davies, Caroline (May 15, 2018). "The royal in-laws: Meghan Markle's family". The Guardian. Retrieved July 10, 2018. ^ Markle, Meghan (August 17, 2015). "I'm More Than An 'Other'". Elle UK. Archived from the original on November 4, 2016. Retrieved November 4, 2016. ^ Morris, Regan (September 26, 2017). "'Meghan who?' LA shrugs over Harry's hometown girlfriend". BBC. Archived from the original on October 26, 2017. Retrieved October 26, 2017. Her childhood in Los Angeles was more centred in Hollywood, where she attended a private primary school known for having a fabulous swimming pool as well as a playground ... Markle attended a private, all-girls Catholic high school on a beautiful campus in the Hollywood Hills. The school requires public service to graduate and the actress credits her parents and the school with starting her commitment to humanitarian work. ^ Boedeker, Hal (November 30, 2017). "Meghan Markle at 11: Fighting sexism on TV". Orlando Sentinel. Archived from the original on December 1, 2017. Retrieved December 1, 2017. ^ Said-Moorhouse, Lauren (March 9, 2018). "Meghan Markle baptized in private ceremony". CNN. Retrieved May 26, 2018. ^ Hodgkin, Emily (September 23, 2017). "Meghan Markle and Kate Middleton's path to royalty REVEALED – from Hollywood to Kensington". Daily Express. UK. Retrieved September 26, 2017. Both girls (i.e., Kate Middleton and Meghan Markle) were educated at private schools. Meghan attended Hollywood Little Red Schoolhouse and then later Immaculate Heart High School, an all-girls, independent Roman Catholic high school in LA. Alumni includes super model Tyra Banks and actress Mary Tyler Moore. ^ Swartz, Tracy (April 17, 2018). "New Meghan Markle book rehashes time at Northwestern". Chicago Tribune. Retrieved April 21, 2018. ^ a b Swartz, Tracy (May 9, 2018). "Meghan Markle recalled as dignified, charitable during her Northwestern days". Chicago Tribune. Retrieved May 13, 2018. ^ a b Willgress, Lydia; Boyle, Danny (September 21, 2017). "Who is Meghan Markle? Everything we know about Prince Harry's girlfriend". The Daily Telegraph. Archived from the original on January 7, 2017. Retrieved April 22, 2017. She studied at a girls' Roman Catholic college before graduating from Northwestern University School of Communication in 2003 – where she double-majored in theatre and international relations – just as her acting career was beginning. She worked for the US Embassy in Buenos Aires. ^ "Meghan Markle exclusive: Diana's biographer Andrew Morton on how the Suits star made it to the heart of the Establishment". The Times. London. April 1, 2018. Archived from the original on April 4, 2018. ^ a b Eades, Chris (December 5, 2017). "Meghan Markle Started Her Acting Career on General Hospital". ABC Soaps In Depth. United States: Bauer Publications. Archived from the original on December 30, 2017. Retrieved January 26, 2018. ^ a b c d Ivie, Devon (November 28, 2017). "Beyond Suits: Your Guide to Meghan Markle's TV Work". Vulture. Archived from the original on November 29, 2017. Retrieved November 28, 2017. ^ Andreeva, Nellie (June 23, 2009). "Meghan Markle joins 'Fringe'". The Hollywood Reporter. Archived from the original on June 29, 2011. Retrieved June 24, 2009. ^ a b Judith Vonberg. "Meghan Markle: Who is Prince Harry's bride-to-be?". CNN. Archived from the original on November 27, 2017. ^ Hibberd, James (August 24, 2010). "Meghan Markle books lead role on 'Legal Mind'". The Hollywood Reporter. Archived from the original on January 23, 2017. Retrieved November 16, 2016. ^ a b Dangremond, Sam. "Meghan Markle Net Worth 2017". Town & Country. Archived from the original on December 2, 2017. Retrieved April 4, 2018. ^ "Meghan Markle". TV Guide. Archived from the original on December 1, 2017. Retrieved November 28, 2017. ^ "Meghan Markle to quit Suits after engagement to Prince Harry". November 27, 2017. Archived from the original on November 27, 2017. ^ "Meghan Markle's final episode of 'Suits' features her in a wedding dress". The Irish Times. April 26, 2018. Retrieved May 22, 2018. ^ Horton, Helena (December 12, 2017). "Meghan Markle's Toronto home – where Prince Harry stayed – up for sale". The Telegraph. Retrieved December 5, 2017. ^ a b c Murphy, Jessica (May 18, 2018). "Meghan's pageboys and Toronto 'royalty'". BBC News. Retrieved May 26, 2018. ^ "Prince Harry and Meghan Markle: What's Their Net Worth?". Fortune. April 4, 2018. Archived from the original on April 4, 2018. ^ "Meghan: From actress to duchess". BBC. October 15, 2018. Retrieved January 6, 2018. ^ a b Russon, Mary-Ann (March 24, 2018). "Meghan Markle: The wellness guru she could have been". BBC. Retrieved January 6, 2018. ^ Porter, Tom (November 27, 2017). "Who Is Meghan Markle's Ex-Husband, Trevor Engelson?". Newsweek. Archived from the original on December 11, 2017. Retrieved December 21, 2017. ^ "How Meghan Markle's Jewish Ex-Husband Became The Guy Who Lost Future Royal Bride". Forward.com. November 19, 2017. ^ "Hitched, Hatched, Hired". The Hollywood Reporter. September 27, 2011. Archived from the original on October 24, 2012. Retrieved February 2, 2013. ^ "36 things we've learnt about Meghan Markle in the past year". The Daily Telegraph. September 5, 2017. Archived from the original on August 18, 2017. ^ "Meghan Markle's Ex-Husband Trevor Engelson Just Got Engaged". Town & Country. June 4, 2018. Retrieved July 15, 2018. ^ Rayner, Gordon (October 31, 2016). "Prince Harry 'met new girlfriend while she was still dating celebrity chef'". The Telegraph. ISSN 0307-1235. Retrieved July 16, 2018. ^ a b Rayner, Gordon. "The Duke of Cambridge approved Prince Harry's plea to trolls to leave Meghan Markle alone". The Daily Telegraph. Archived from the original on September 12, 2017. Retrieved September 5, 2017. ^ Furness, Hannah (November 27, 2017). "Prince Harry and Meghan Markle engaged: 'She didn't even let me finish!' Couple describe 'sweet, natural and very romantic' proposal". The Daily Telegraph. Archived from the original on November 27, 2017. Retrieved November 28, 2017. ^ "Prince Harry, Meghan Markle to finally tie the knot". CBC News. Archived from the original on November 27, 2017. ^ James, William (April 18, 2018). "Prince Harry promises to listen as he starts new Commonwealth job". Reuters. Retrieved December 19, 2018. ^ Vallance, Adam (November 8, 2016). "A Statement by the Communications Secretary to Prince Harry". The Royal Family. Archived from the original on September 27, 2017. Retrieved September 26, 2017. ^ Booth, Robert; Lisa O'Carroll (November 8, 2016). "Prince Harry attacks press over 'wave of abuse' of girlfriend Meghan Markle". The Guardian. Archived from the original on September 7, 2017. ^ "Meghan Markle attends Invictus Games". BBC News Online. September 24, 2017. Archived from the original on September 27, 2017. Retrieved September 26, 2017. ^ "Prince Harry, Meghan Markle make first official public appearance". ABC News. September 26, 2017. Archived from the original on September 25, 2017. Retrieved September 26, 2017. ^ Bourke, Latika (November 27, 2017). "Royal wedding: Prince Harry and Meghan Markle announce engagement". The Age. Archived from the original on November 27, 2017. Retrieved November 27, 2017. ^ Katwala, Sunder (May 25, 2018). "Meghan Markle has already changed the way we think about race". The Daily Telegraph. Retrieved July 12, 2018. ^ Falzone, Diana. "Meghan Markle will quit acting following engagement to Prince Harry". Fox News Channel. Archived from the original on November 27, 2017. Retrieved November 27, 2017. ^ "Prince Charles to walk Meghan down the aisle". May 18, 2018 – via www.bbc.com. ^ "How will Meghan Markle become a British citizen?". BBC News. December 1, 2017. Retrieved July 12, 2018. ^ a b Walter, Stephen (March 8, 2018). "Meghan Markle 'baptised by Archbishop of Canterbury ahead of wedding to Prince Harry'". The Daily Telegraph. Archived from the original on March 9, 2018. Retrieved March 9, 2018. ^ Vickers, Hugo (May 18, 2018). "St George's Chapel: Inside the Windsor Castle venue for tomorrow's royal wedding". The Daily Telegraph. Retrieved May 18, 2018. ^ Ward, Victoria (May 22, 2018). "Nottingham Cottage: The Kensington home where Meghan and Harry live as a married couple". The Telegraph. Retrieved July 12, 2018. ^ "With child coming, it's off to the country for Prince Harry and Meghan Markle". NBC News. November 24, 2018. Retrieved November 24, 2018. ^ "Prince Harry and Meghan are moving to the suburbs". CBS News. November 24, 2018. Retrieved November 24, 2018. ^ Hill, Erin (March 14, 2019). "Meghan Markle and Prince Harry Have Split Royal Households from Kate Middleton and Prince William". People. Retrieved March 14, 2019. ^ "Meghan and Harry: Duchess of Sussex expecting a baby". BBC News. October 15, 2018. Retrieved October 15, 2018. ^ a b c Booth, Robert (November 30, 2017). "Meghan Markle's activism to be held in check by royal protocol". The Guardian. Retrieved January 6, 2019. ^ Sar, Emine (December 1, 2017). "Not your average royal: what we know so far about Meghan Markle". The Guardian. Retrieved January 6, 2019. ^ Davies, Caroline (December 1, 2017). "Meghan Markle begins royal induction with Nottingham walkabout". The Guardian. Archived from the original on December 3, 2017. Retrieved December 4, 2017. ^ "Prince Harry and Meghan Markle wow Nottingham crowds on first joint visit". BBC. December 1, 2017. Archived from the original on December 3, 2017. ^ McCluskey, Megan (February 28, 2018). "Meghan Markle Shines at First Royal Engagement With Prince Harry, Prince William and Kate Middleton". Time. Archived from the original on March 13, 2018. Retrieved March 9, 2018. ^ Holden, Michael (February 28, 2018). "Britain's royal 'Fab Four' attend first official event together". Reuters. Archived from the original on February 28, 2018. Retrieved March 9, 2018. ^ Abrams, Margaret (March 8, 2018). "Meghan Markle Is Now Encouraging Young Girls to Take Up Acting". The Observer. Archived from the original on March 9, 2018. Retrieved March 9, 2018. ^ "Meghan Markle joins Queen for first time at official royal event". The Times. March 12, 2018. Retrieved March 12, 2018. ^ "Prince Harry and Meghan Markle in Northern Ireland: Couple's rapturous welcome on unannounced visit". The Daily Telegraph. March 23, 2018. Archived from the original on March 23, 2018. Retrieved March 23, 2018. ^ "Royal wedding facts and figures: From how many people are invited, to the cost of Windsor parking". The Daily Telegraph. May 21, 2018. Retrieved May 21, 2018. ^ Furness, Hannah (May 22, 2018). "Duke and Duchess of Sussex make first appearance as a married couple at Prince Charles' 70th birthday party". The Daily Telegraph. Retrieved May 22, 2018. ^ "Britain's Prince Harry and Meghan Markle set for first trip abroad as newlyweds with Dublin tour". Independent.ie. June 19, 2018. Retrieved June 19, 2018. 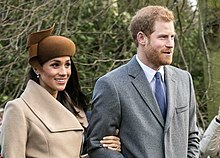 ^ "Prince Harry and Meghan Markle to visit Dublin". The Irish Times. June 19, 2018. Retrieved June 19, 2018. ^ Furness, Hannah (April 16, 2018). "Prince Harry reveals Meghan Markle will take on Commonwealth role". The Daily Telegraph. Retrieved December 19, 2018. ^ "Royal tour: Harry and Meghan's overseas trip so far". BBC. October 31, 2018. Retrieved December 19, 2018. ^ a b Lyons, Kate (October 19, 2018). "Bearing a baby and banana bread, Harry and Meghan enchant Australia". The Guardian. Retrieved December 19, 2018. ^ Furness, Hannah (October 16, 2018). "Duchess of Sussex says 'we're ready and excited to join the club' after pregnancy announcement". The Daily Telegraph. Retrieved December 19, 2018. ^ Perry, Simon; Hill, Erin (February 23, 2019). "Meghan Markle and Prince Harry Arrive Hand-in-Hand in Morocco for Last Royal Tour Before Baby". People. Retrieved February 24, 2019. ^ "Meghan Markle Is in the Running for Time Magazine's Person of the Year". Townandcountrymag.com. December 10, 2018. Retrieved December 16, 2018. ^ Chopra, Priyanka. "Meghan Markle is on the 2018 TIME 100 list". Time. Retrieved May 24, 2018. ^ Mackelden, Amy (April 19, 2018). "Prince Harry and Meghan Markle Just Made the TIME 100 List Ahead of Their Wedding". Harper's Bazaar. Archived from the original on April 20, 2018. ^ "The Vogue 25: Meet The Women Shaping 2018". British Vogue. May 31, 2018. Retrieved May 31, 2018. ^ "Harry and Meghan's new Instagram account is a record-breaking hit with millions". USA TODAY. Retrieved 2019-04-20. ^ a b c Pentelow, Orla (June 19, 2018). "The Duchess Of Sussex: Style File". British Vogue. Retrieved July 8, 2018. ^ a b c Bayley, Leanne (May 22, 2017). "Meghan Markle chats to GLAMOUR about VB dresses, her personal style & her fashion cringe moments". Glamour UK. Retrieved July 9, 2018. ^ Barsamian, Edward (July 6, 2018). "The Duchess Of Sussex Breaks Away From Her Uniform Style In Brandon Maxwell". British Vogue. Retrieved July 8, 2018. ^ Ledbetter, Carly (July 5, 2018). "Meghan Markle Can't Stop Wearing The Same Style Of Dress". HuffPost. Retrieved July 8, 2018. ^ a b Ward, Victoria (December 1, 2017). "Scottish family handbag firm feels the 'Meghan effect' as Strathberry orders soar". The Telegraph. ISSN 0307-1235. Retrieved February 9, 2018. ^ a b Friedman, Vanessa (April 25, 2018). "Meghan Markle: The Biggest Influencer of All?". The New York Times. Retrieved July 9, 2018. ^ a b Hirsch, Afua; Croft, Claudia (May 18, 2018). "The Meaning Of Meghan". British Vogue. Retrieved May 31, 2018. ^ "How to Dress Meghan Markle (Hint: You Probably Can't)". The Business of Fashion. May 16, 2018. Retrieved May 24, 2018. ^ "Meghan Markle makes gold sales sparkle". CNBC. May 25, 2018. Retrieved May 31, 2018. ^ "Royal Family lead Tatler's 2018 best-dressed Brits list". BBC. August 2, 2018. Retrieved October 18, 2018. ^ Morton, Becky (October 17, 2018). "Meghan's maternity and the fashion brands hoping to strike gold". BBC. Retrieved October 18, 2018. ^ "Best Dressed 2018". Net a Porter. ^ Cohen, Jess (June 13, 2018). "Teen Choice Awards 2018: Avengers: Infinity War, Black Panther and Riverdale Among Top Nominees". E! News. Retrieved June 13, 2018. ^ "2014 CJCS Holiday USO Tour". Defense Visual Information Distribution Service. December 6, 2014. Retrieved November 28, 2018. ^ "Justin Trudeau welcomes Emma Watson, Bob Geldoff, and other star activists to Parliament Hill". Ottawa.ctvnews.ca. Archived from the original on May 9, 2017. Retrieved May 23, 2017. ^ Stack, Sarah. "Meghan Markle: I had to refuse being filmed in just a towel every day". The Irish Independent. Dublin, Ireland: Independent News & Media. ^ "The Year in USO Entertainment". United Service Organizations. Archived from the original on February 1, 2017. Retrieved December 3, 2017. ^ "A Look Back at Meghan Markle's Pre-Royal Life". E!. Archived from the original on December 2, 2017. Retrieved December 3, 2017. ^ Ruiz, Michelle. "Meet Meghan Markle: Prince Harry's Feminist, Philanthropist, Actress Girlfriend". Vogue. Archived from the original on September 15, 2017. Retrieved December 3, 2017. ^ a b Blair, Olivia (October 31, 2016). "Who is Meghan Markle: The 'Suits' actress, humanitarian, activist and gender equality campaigner". The Independent. Archived from the original on September 15, 2017. Retrieved September 15, 2017. ^ Watkins, Janelle (February 29, 2016). "Meghan Markle 'Suits' Up for Success". Eabony. Archived from the original on April 21, 2016. Retrieved June 29, 2016. ^ "The Duchess of Sussex". The Royal Family. May 18, 2018. Retrieved May 18, 2018. ^ Singh, Harmeet (August 7, 2015). "UN Women turn on the light". Strategy Online. Brunico Communications Ltd. Archived from the original on August 17, 2015. Retrieved November 28, 2016. ^ Furness, Hannah (May 21, 2018). "Meghan Markle to fight for feminism: New Duchess of Sussex given palace blessing to champion women's rights". The Daily Telegraph. Retrieved July 12, 2018. ^ "Meghan launches Grenfell recipe book in first project as Duchess of S…". January 12, 2019. Archived from the original on January 12, 2019. ^ "Meghan Markle cooks for Grenfell: Duchess supports charity cookbook -…". January 1, 2019. Archived from the original on January 1, 2019. ^ "Meghan made patron of National Theatre". BBC. January 10, 2019. Retrieved January 10, 2019. ^ Barry, Ellen (March 8, 2019). "Meghan Markle 'Moved the Dial' for British Royal Family in Women's Day Talk". The New York Times. Retrieved March 8, 2019. ^ "Royal wedding: Harry and Meghan appointed Baron and Baroness of Kilkeel". Belfast Telegraph. May 19, 2018. Retrieved May 19, 2018. ^ Fitzmaurice, Rosie (May 19, 2018). "Meghan Markle is officially a Duchess — here's her new title". Business Insider. Archived from the original on May 24, 2018. ^ "Prince Harry and Ms. Meghan Markle: Announcement of Titles". The Royal Family. May 19, 2018. Retrieved May 19, 2018. ^ "First Duke of Sussex was unlucky in love". May 19, 2018 – via www.bbc.com. ^ a b c "Her Royal Highness The Duchess of Sussex: Coat of Arms". The Royal Family. May 25, 2018. Retrieved May 25, 2018. ^ a b "Royal Wedding 2018: Meghan Markle coat of arms revealed". BBC. May 29, 2018. Retrieved October 14, 2018. ^ "Pacific Ocean features in new royal Markle's Coat of Arms". Reuters. May 25, 2018. Retrieved May 25, 2018. ^ "Meghan Markle's Jonesboro roots". The Times. Retrieved December 6, 2017. ^ a b "Tracing Meghan Markle's 'German roots'". Deutsche Welle. May 11, 2018. Retrieved May 23, 2018. ^ "Meghan Markle: Six things you didn't know about Prince Harry's girlfriend". The Week. November 8, 2016. Archived from the original on November 10, 2016. ^ Roberts, Gary Boyd. "The Royal Ancestry of Meghan Markle". New England Historic Genealogical Society. Archived from the original on December 1, 2017. Retrieved December 16, 2017. The Rev. William Skipper's ancestors Sir Philip Wentworth (died 1464) and Mary Clifford are ancestors also, in various lines, of both H.M. the late Queen Mother (and thus H.M. the Queen, the Prince of Wales, and Prince Harry) and of the late Diana, Princess of Wales. ^ Horne, Marc (April 3, 2018). "Meghan Markle 'is descended from Robert the Bruce'". The Times. Retrieved April 3, 2018. ^ McGooran, Cara (November 30, 2017). "Meghan Markle was a Deal or No Deal suitcase model – so what happened to the rest of them?". London: Telegraph Media Group Limited . Archived from the original on April 13, 2018. Markle, Meghan (May 2015). "It's All Enough". Darling Magazine. , republished online, November 6, 2018. Markle, Meghan (July 2015). "I'm More Than An 'Other'". ELLE. , republished online, December 22, 2016. Markle, Meghan (November 9, 2016). "With Fame Comes Opportunity, But Also A Responsibility". ELLE. Markle, Meghan (March 8, 2017). "How Periods Affect Potential". Time. HRH The Duchess of Sussex, "Foreword," in: The Hubb Community Kitchen (2018). Together: Our Community Cookbook. Ebury Press. ISBN 1529102928. OCLC 1055685147.